Barolo is certainly one of the great wines of Italy, many would argue that it is the greatest, but there is no doubt that the wines of Barolo are as regal as they are compelling, having captured the imagination of wine-lovers around the globe. 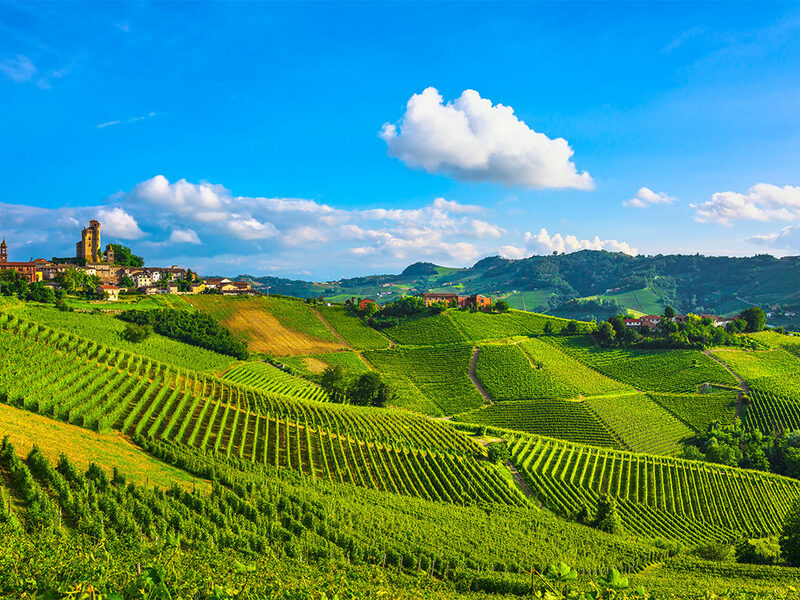 Situated in Northern Italy’s beautiful Piemonte (translating to ‘foot of the mountains’, or foothills of the pre-Alps), Barolo is blessed with calcareous marl soil, and a position between the Mediterranean and the tall Alps to the north, allowing for a unique situation with regards to weather, as the region is protected from cold northern winds, yet gathers the warm Mediterranean weather systems despite a northern location. The position feels nearly strategic with regards to viticulture. This particularity of soil and weather, as they are married to the fabled Nebbiolo grape, is what makes Barolo so singular in the world of wine. Fans of Nebbiolo will tell you, though many have tried, you are hard-pressed to find compelling examples of Nebbiolo outside of the Piedmont. When we think of how the Alba white truffle is also impossible to replicate elsewhere, we realize, we are dealing with one of the most unique terroirs in the world. Culturally, Barolo is perhaps the place where the tension between Modern and Traditional winemaking technique is the most felt. The 1990s saw an influx of winemakers using new techniques such as aging the wine in new barrique barrels, using roto-fermenters, and shorter maceration times, creating darker, plusher, softer wines that did not require as long of time in cellar before they could be enjoyed, and the popularity of the region soared. However, there was also an old guard of winemakers who saw this ‘fashion’ as an affront to the cultural traditions of the region, which favored using very old, very large format botte barrels made of Slavonian oak, and long maceration times that could go from anywhere from 60-120 days. This tradition of long maceration was really born out of necessity, the grapes were brought into the cellar and crushed, and put in large barrels until all the other harvest chores were done, because grapes were not the only crop, this was a poor region built on subsistence farming. These days, as much as marketing executives might like to create a binary of Modern versus Traditional, the lines are blurred. Chiara Boschis and Elio Altare, both modern in terms of using shorter maceration times and newer barrique, also farm organically and make wines that undoubtedly show the typicity of Barolo. We also hear of ‘traditional’ winemakers who now green harvest, a process which involves cutting bunches off the vine before the harvest in order to allow the vine to focus its energies on the remaining bunches. In the poor Barolo of yesteryear, the idea of dropping good fruit on the ground would have been unthinkable. While the camps of Barolo may be more gray than black and white, one thing is clear, that Barolo has a long, deep and rich history, as well as a bright future that we are excited to see unfold. This week, we will be pouring some iconic wines from the region, including Giovanni Canonica’s ‘Paiagallo’ 2012 out of magnum, followed by Giuseppe Mascarello’s ‘Monprivato’ 2012. Removing the variable of vintage, this is a great opportunity to taste the difference between the terroir of two great vineyards in Barolo and Castiglione Falleto. On Wednesday, Thursday and Friday, we will delve into two of the great vineyards of Serralunga d’Alba, as well as three vintages, pouring Massolino’s ‘Vigna Rionda’ 2000 and Principiano’s ‘Boscareto’ 2008 & 2006, the latter two poured from Double-Magnum. Finally, on Saturday and Sunday, we will pour Vietti’s ‘Rocche’ and ‘Brunate’ 2011 from Double-Magnum, exploring the terroir of two the great vineyards of Castiglione Falleto and Barolo.